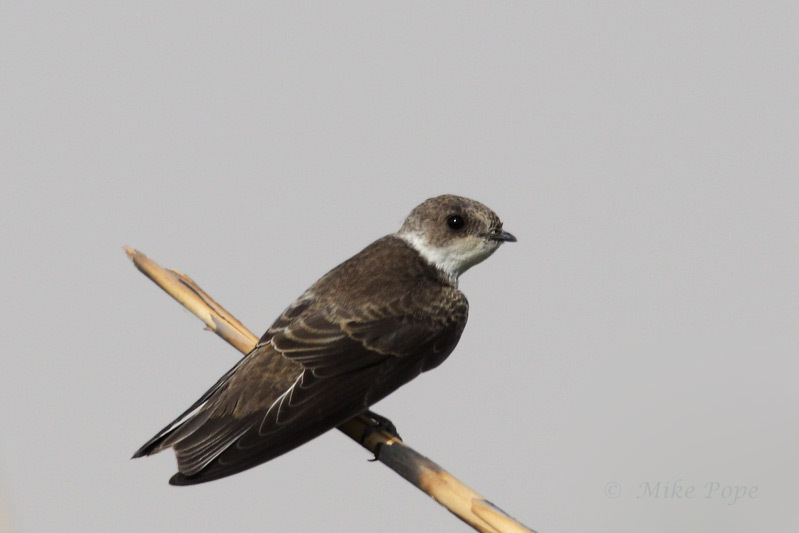 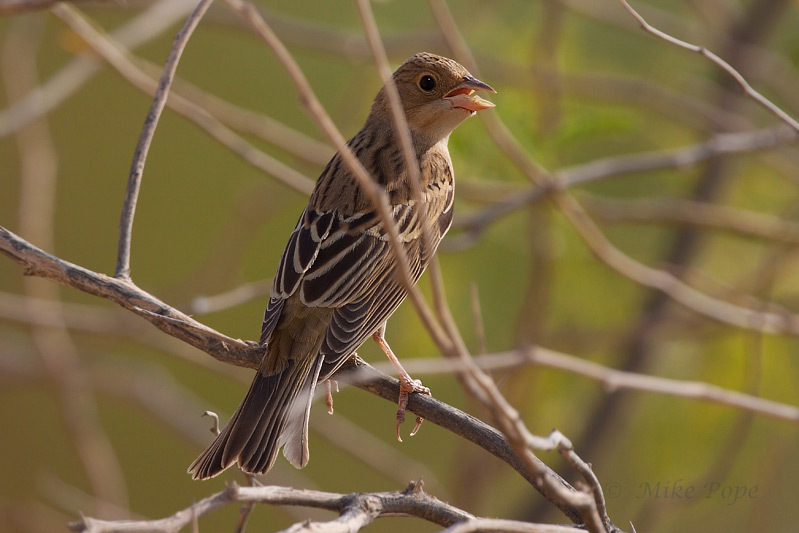 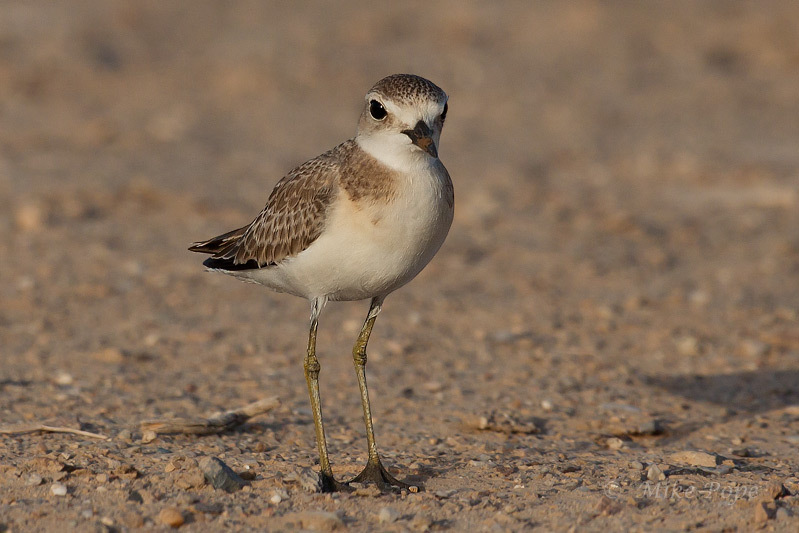 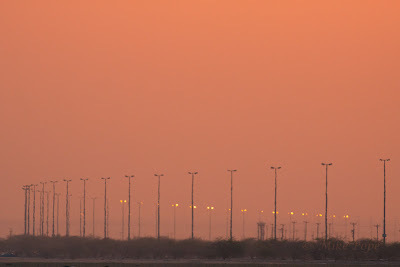 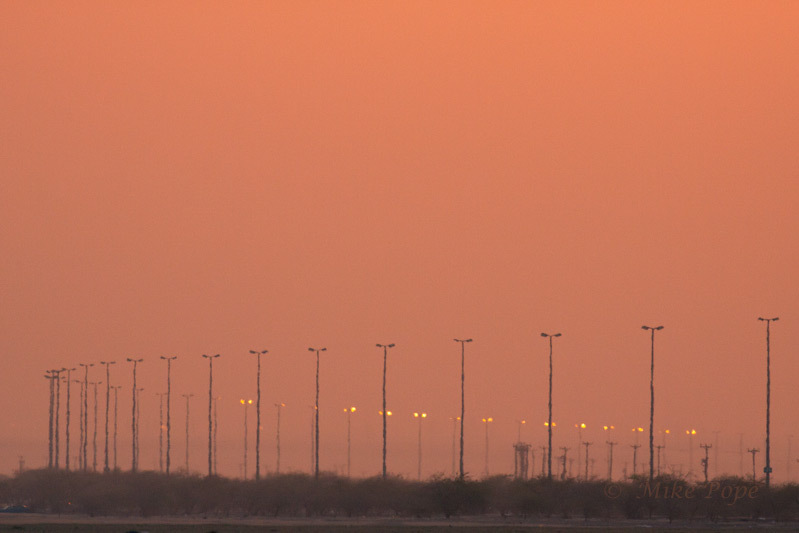 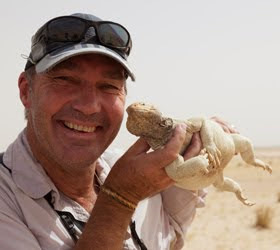 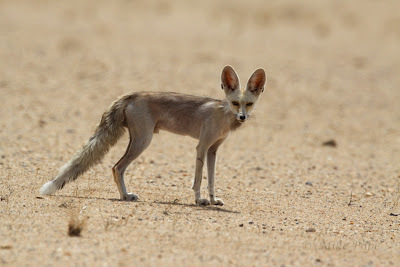 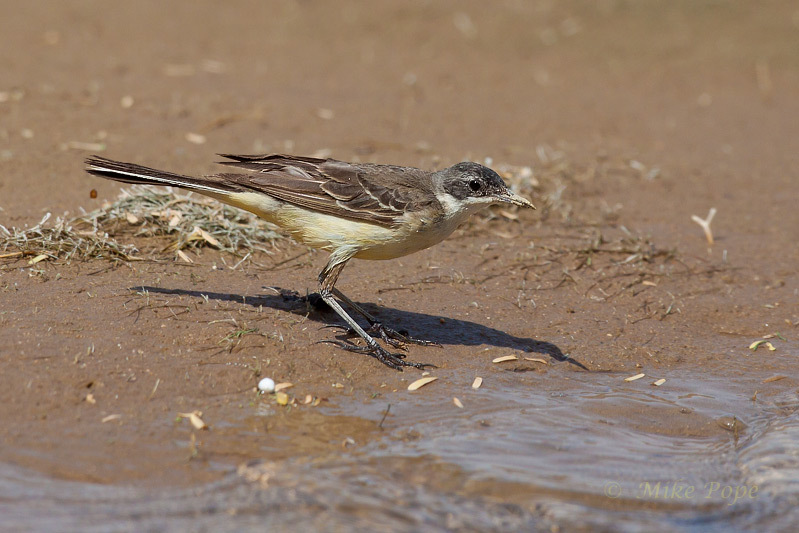 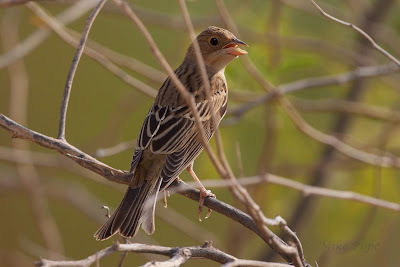 Although it is still a little too early for 'autumn' migration, I though I would check out the oasis farm at Al Abraq, so another early wake-up call to get there while the temperatures were still bearable. 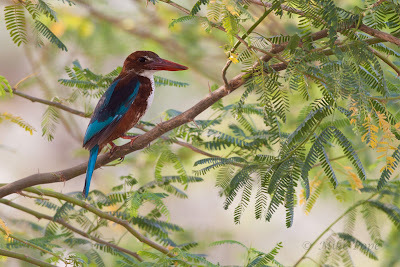 The pool at the entrance to the farm provided a place for this White-throated Kingfisher to catch fish at it's leisure. A last drive around the farm, wilting in the heat produced a small flock of Black-headed Buntings with one adult in moulting plumage (a record shot ruined by heat haze) and the rest were probably first year birds. 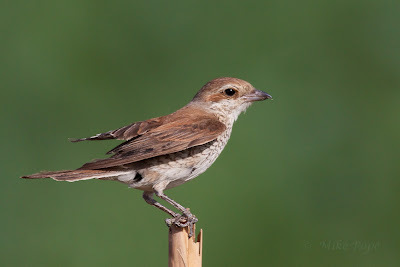 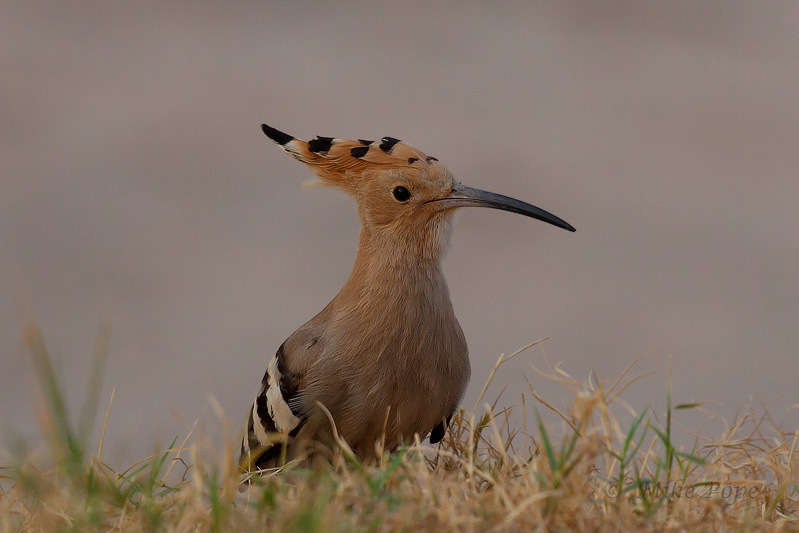 During Ramadan we have shortened working hours, so if you are willing to get up really early, you can do some birding before work - which is what I did today. During the course of my stay, other Warblers were also seen - but more often than not, it was fleeting, so for a good image you had to be constantly at the ready. 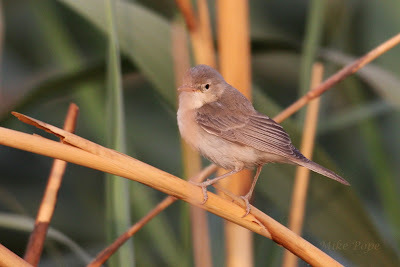 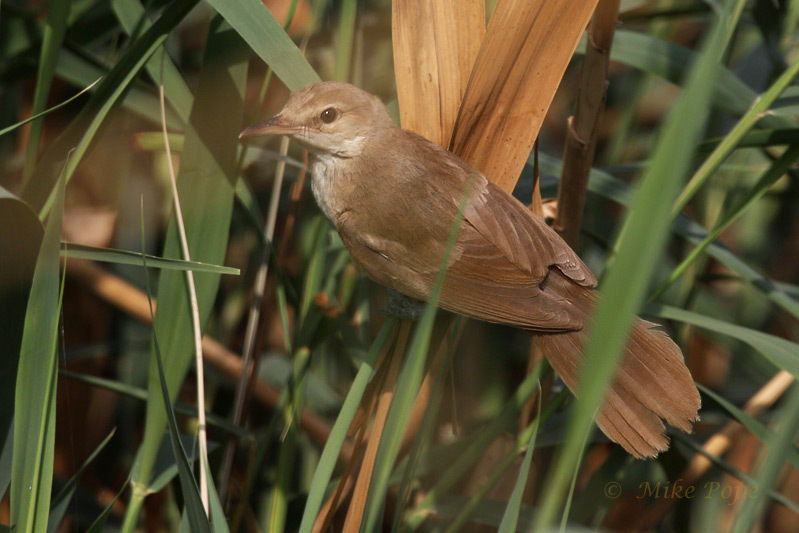 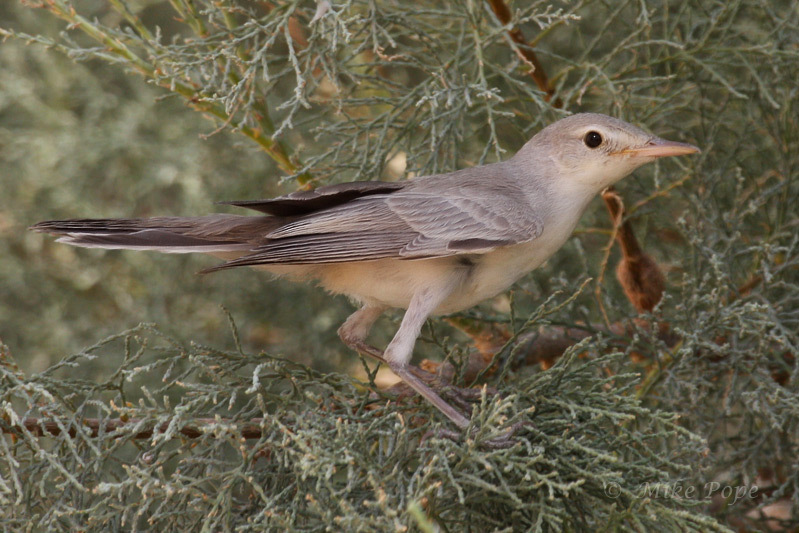 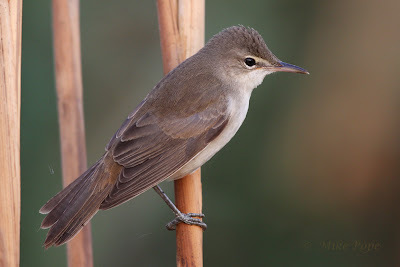 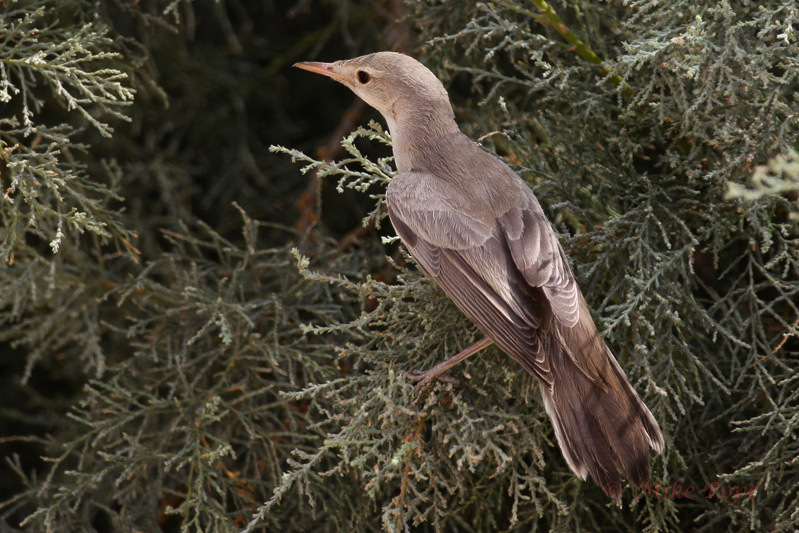 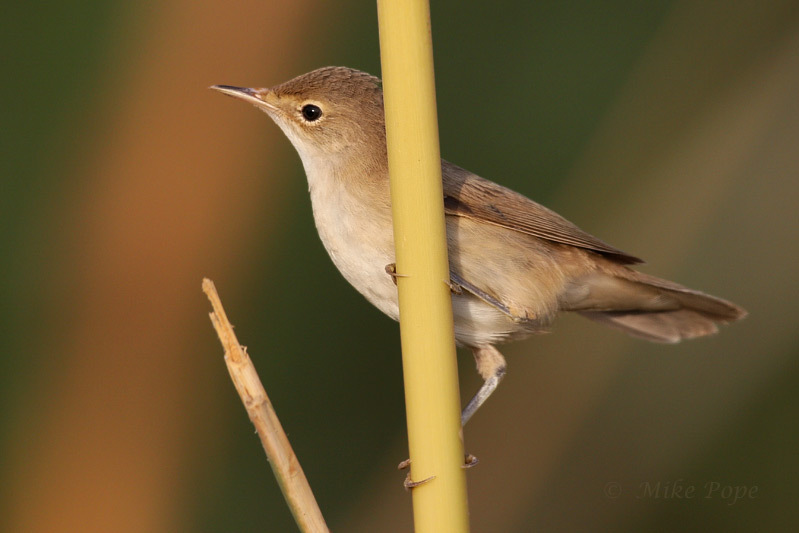 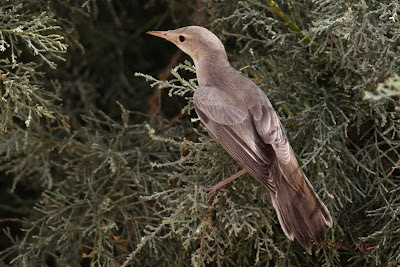 I think this may be a Caspian Reed Warbler with cold appearance and tinges of grey - but I stand to be corrected. 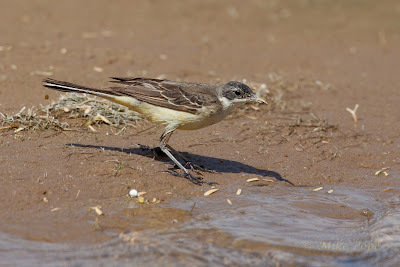 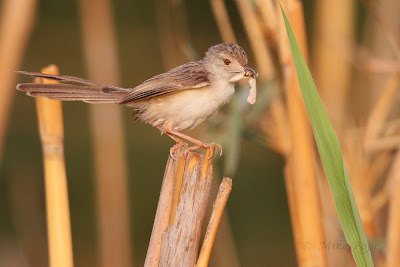 Graceful Prinia's were also active around the fringes of the reedbeds.. I had seen the Indian Reed Warbler flying up and down the outfall, but not stopping anywhere near me. 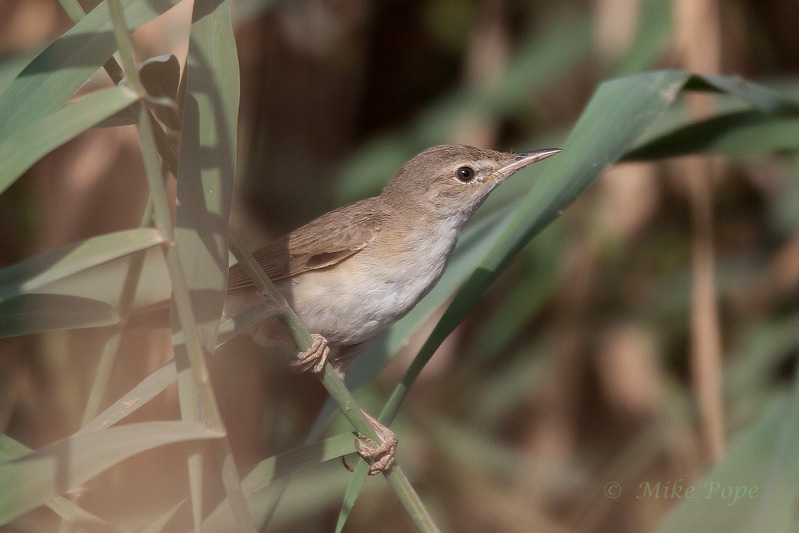 Just as I was about to move to the next location, one flew in very briefly and I managed to 'grab' this image through the reeds before it disappeared. 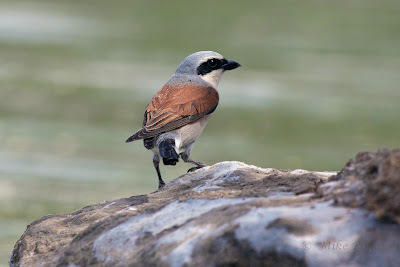 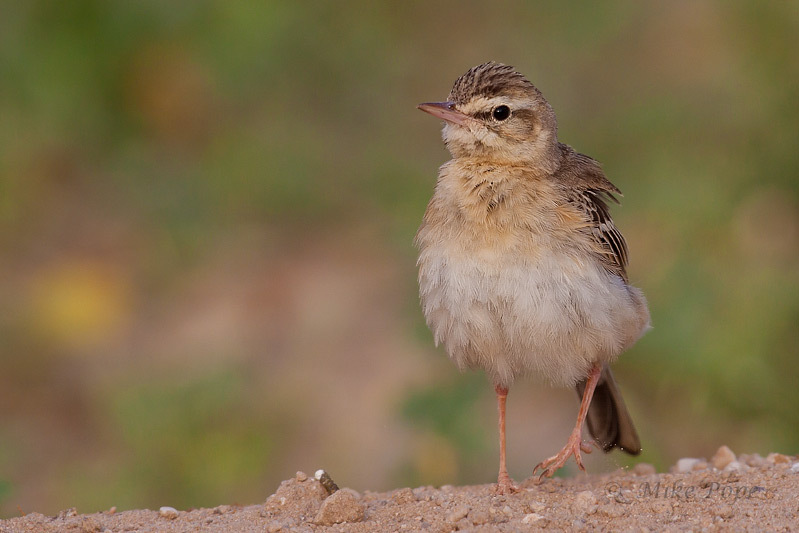 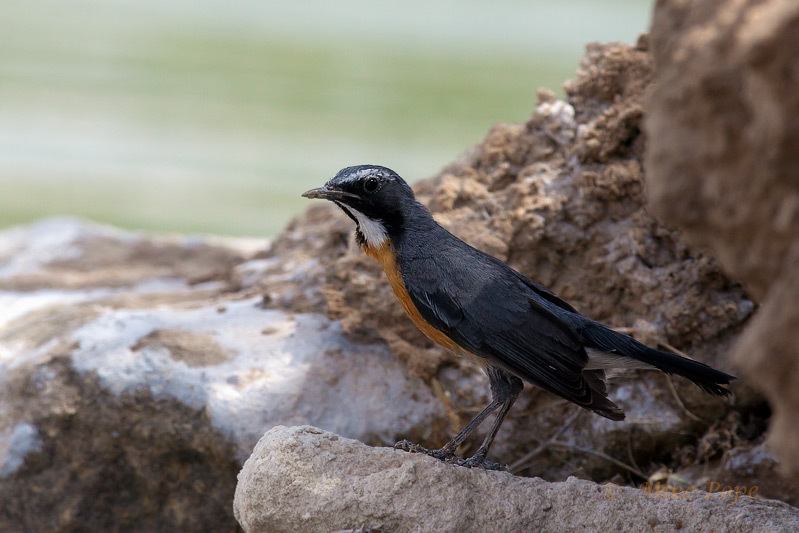 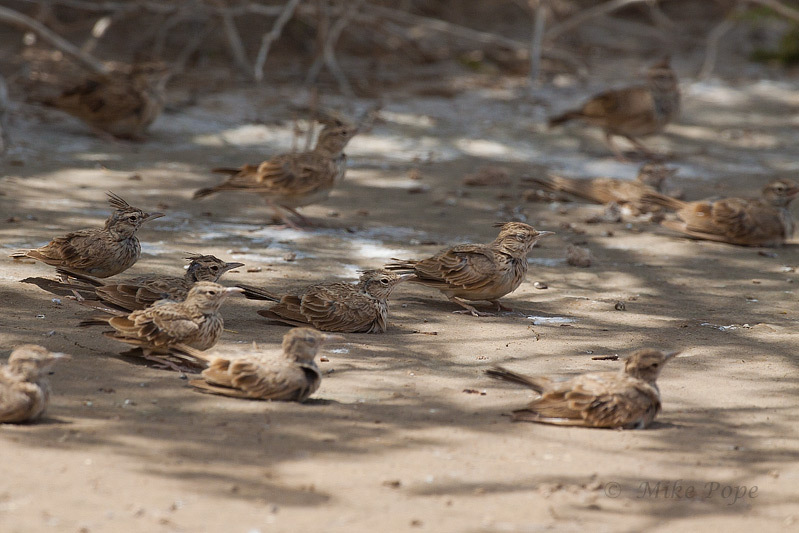 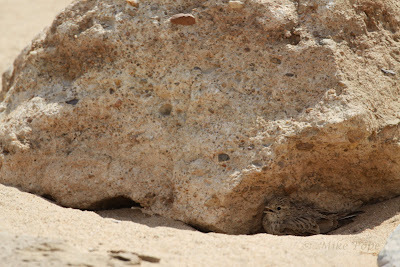 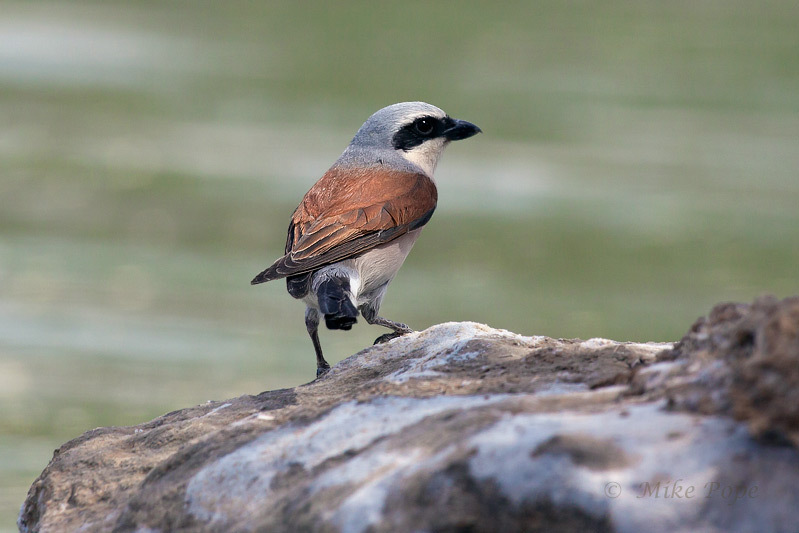 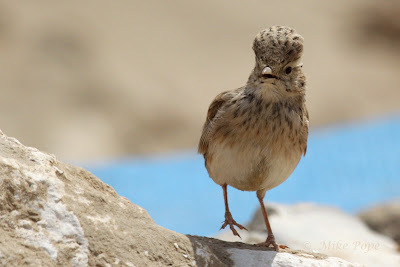 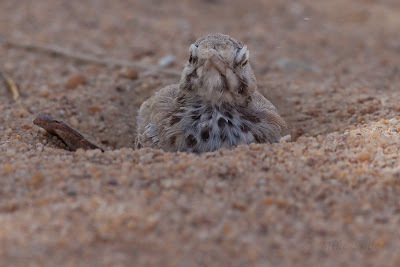 Here is one shelterning in the shade of a small rock, to escape the morning heat which was already up to 50 degrees C. It is truly amazing how these small birds survive in such extreme temperatures and conditions. 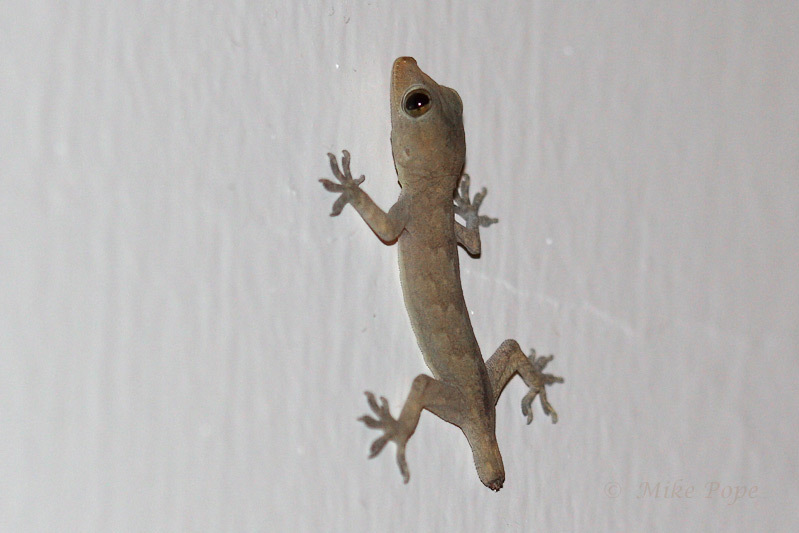 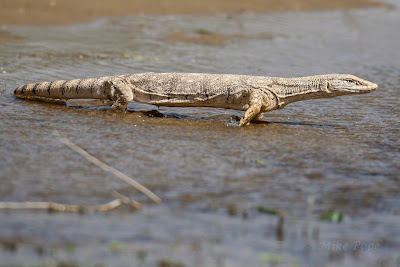 While editing the images in my apartment, our new friend named 'Grecko' by my son, went about his business of looking for food in our apartment. 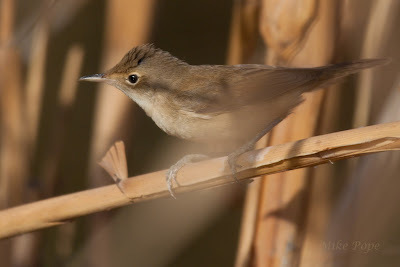 Not sure which species this is? 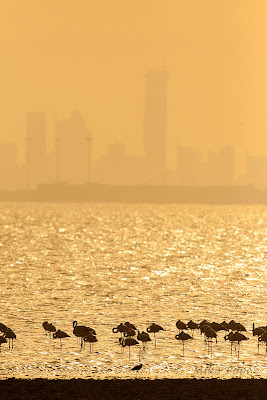 Back in Kuwait after a wonderful summer vacation in Italy and now without my family who have migrated south for winter in South Africa. I took some time to get out to see what was about in the heat of summer. 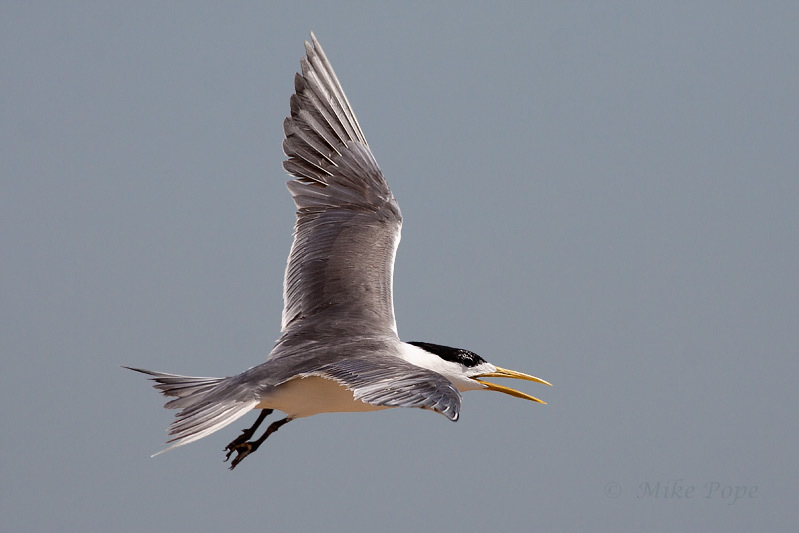 and White winged Terns were feeding on a brisk wind. I did well to get these flight shots hand-holding the 600mm with a 50D that hunts when the bird moves off the center focus point in this strong wind. 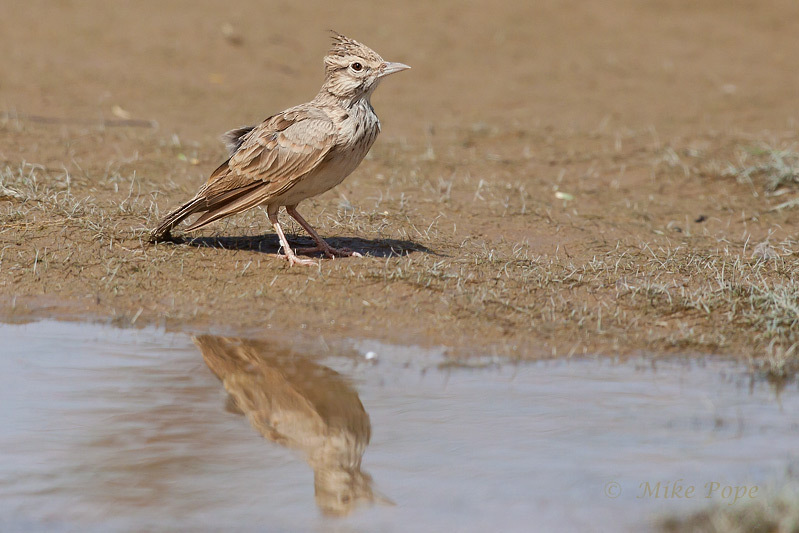 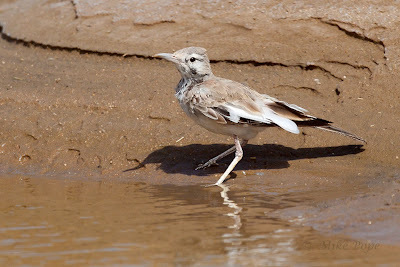 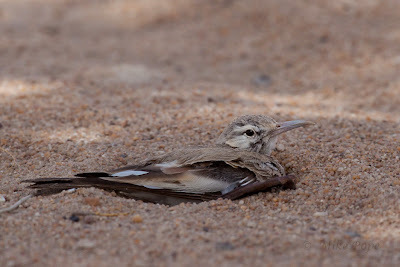 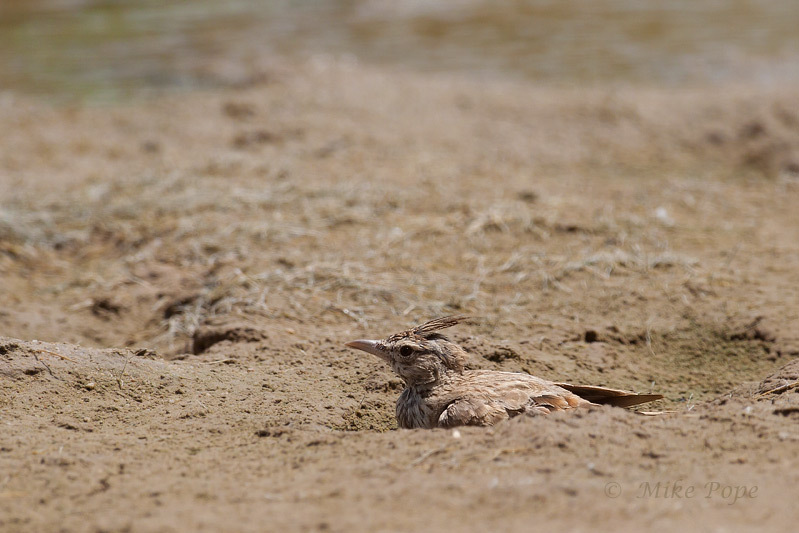 A Greater Hoopoe Lark came down to drink and then quickly ran away for some shade and to reduce its profile from the wind and flying sand in a small scrape. 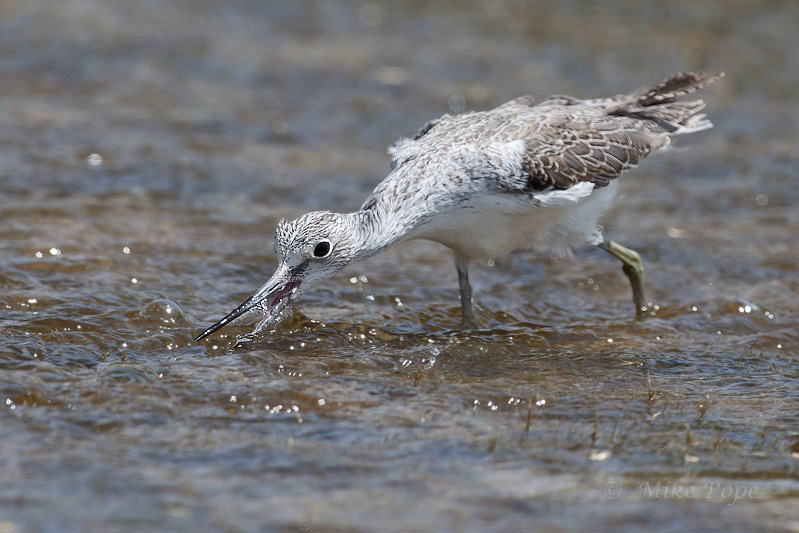 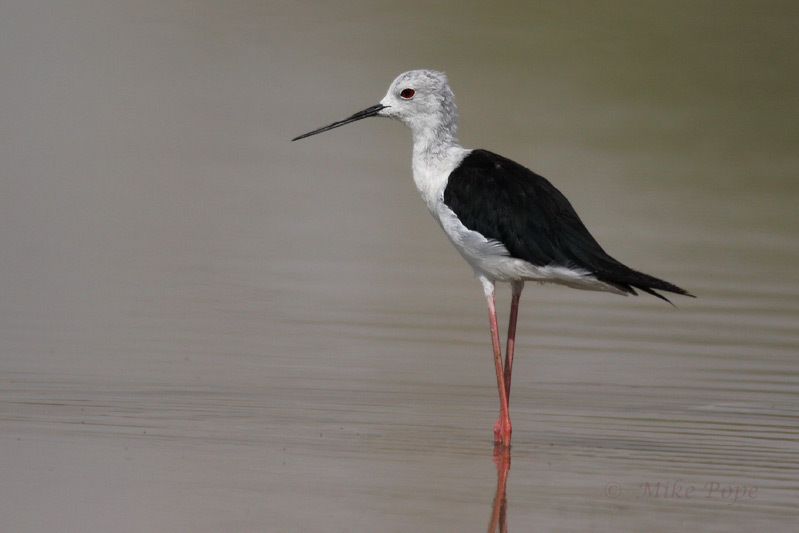 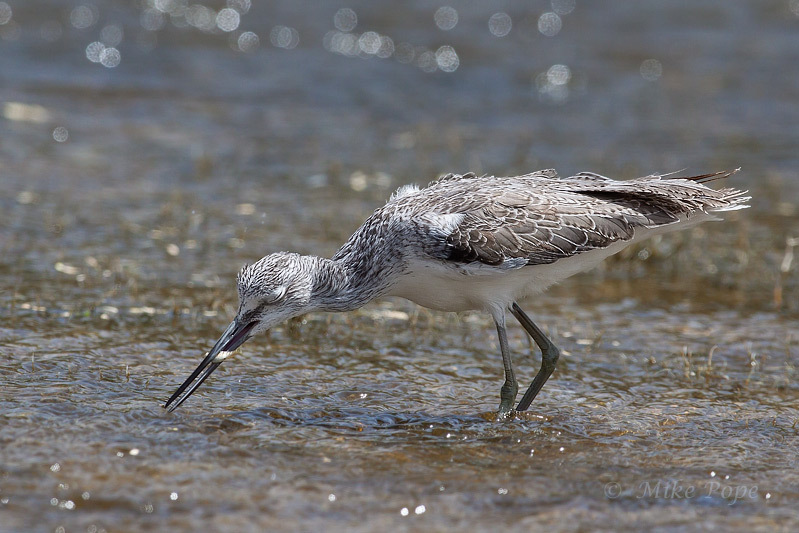 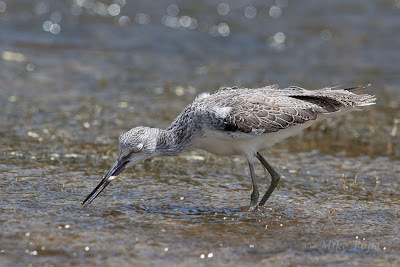 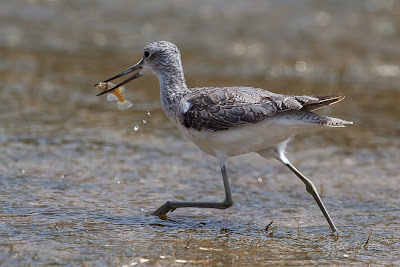 I was entertained for about 20-minutes watching a Common Greenshank catch fish, almost in the same manner as Little Egrets and Indian Reef Herons which I have not seen before. 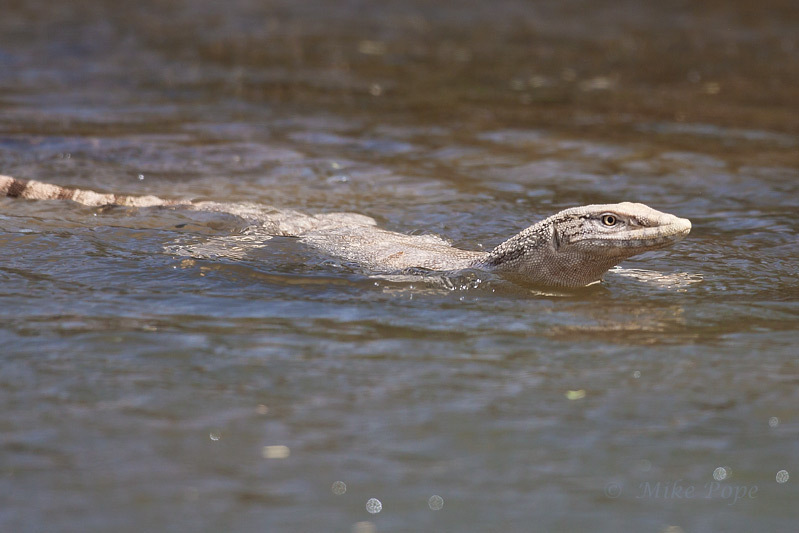 It literally ran after fish in shallow water with mouth open (a little like a Skimmer) and was very successful. 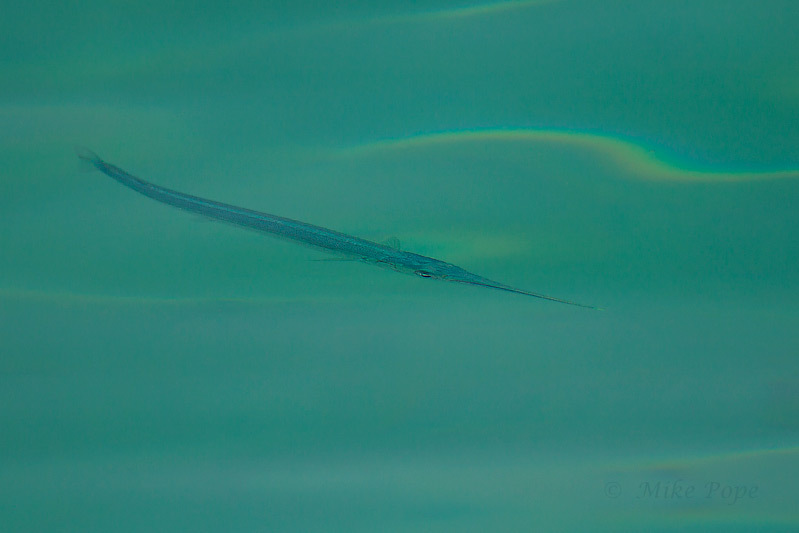 I saw it catch 5 fish in the 20-minutes I watched it - not quite so easy to photograph though, as it was difficult to predict which way it would turn and run. 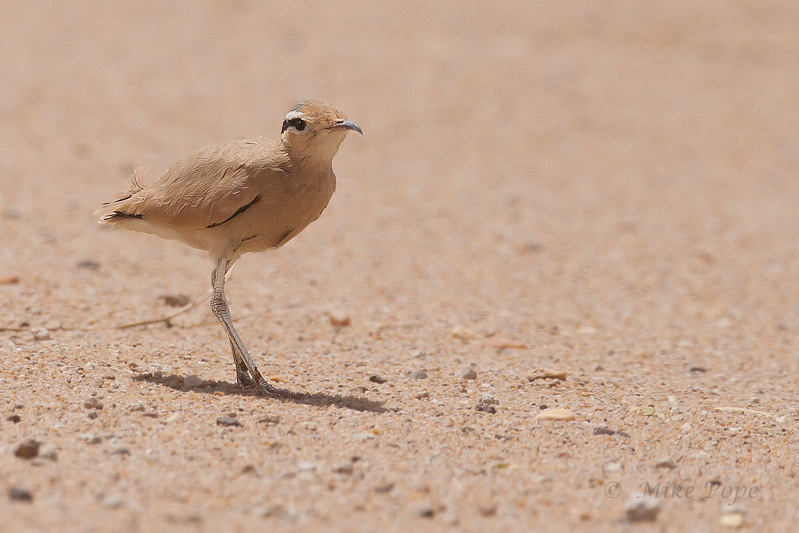 Finally I started wilting in the heat, so headed back to the a/c of my apartment - finding a Cream-coloured Courser on the way out trying to find a place to shelter from the gusting wind. 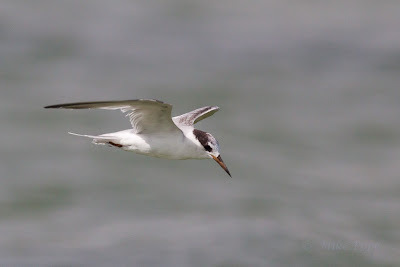 This was to be our last family outing with Graham Whitehead joining us, before our long-awaited summer holiday and we couldnt have wished for a better day in terms of weather and sea conditions. 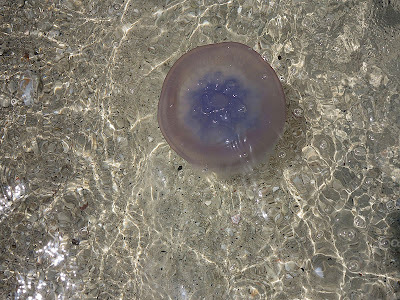 Actually I have difficulty calling it a sea when the water was so flat, calm and mirror like, especially when compared to the pelagic trips off Cape Town. 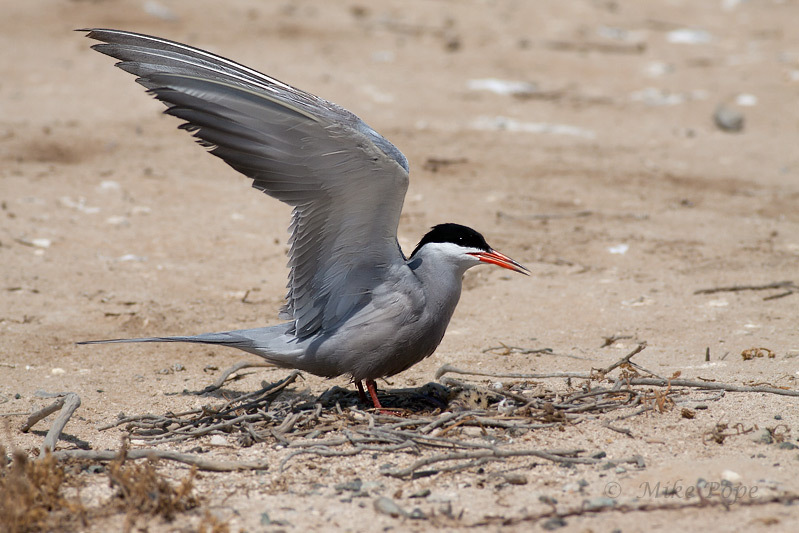 Summer is peak time for 4 species of Tern that breed on this tiny sand island that has suitable habitat for each of the 4 species. 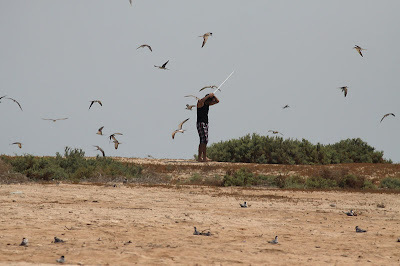 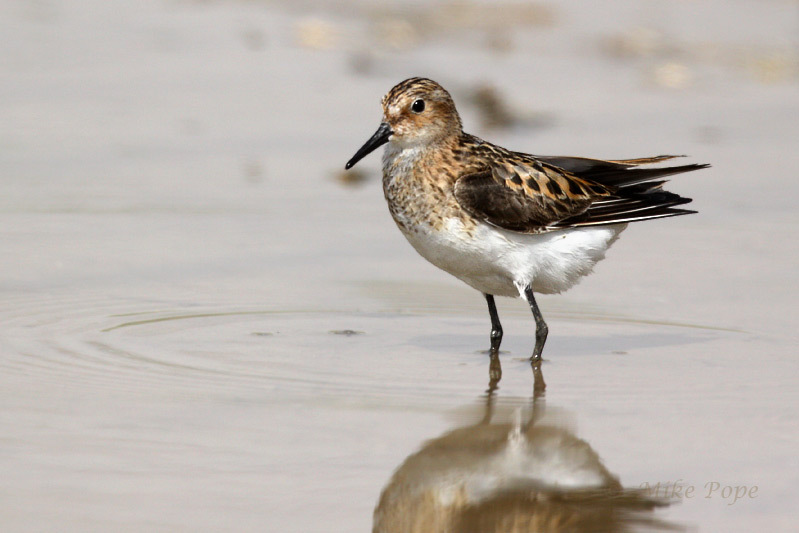 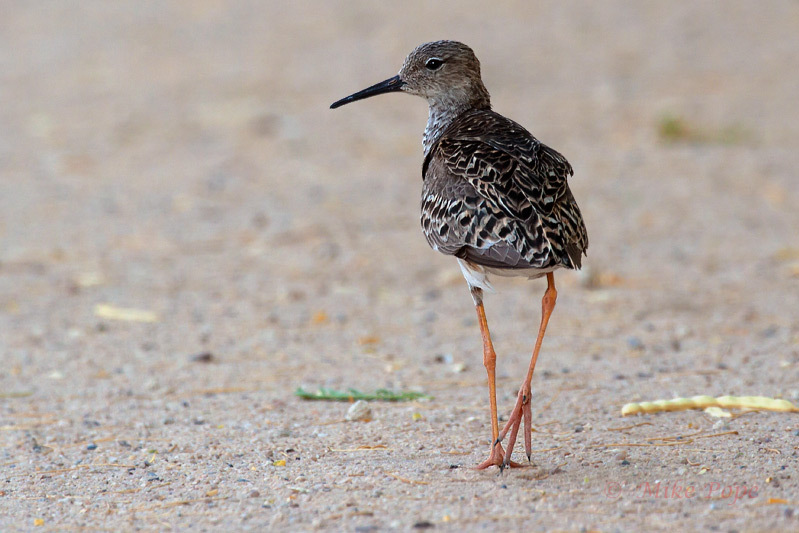 Unfortunately, this is also a very popular destination for boats and jet-skis and creates a lot of additional pressure for these birds due to uneccessary human disturbance. 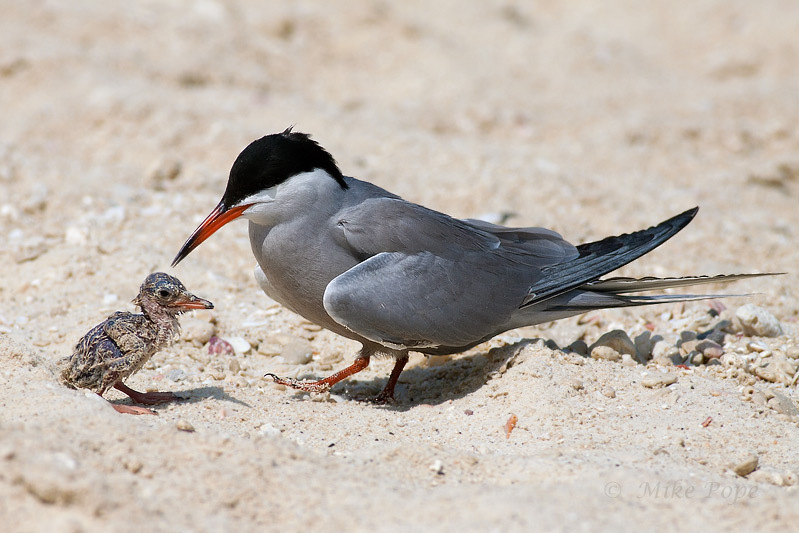 Since there are no natural predators on the island, I believe most fatalities of young are due to over-exposure from the harsh summer temperatures. 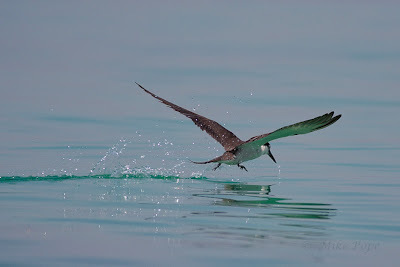 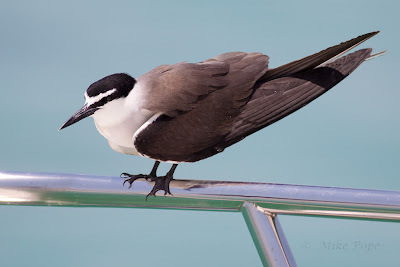 Normally the first species you see on approach to the Island are Bridled Terns and it doesnt take long for them to use the boat as a perch to get higher above the ground and water for slightly cooler air. 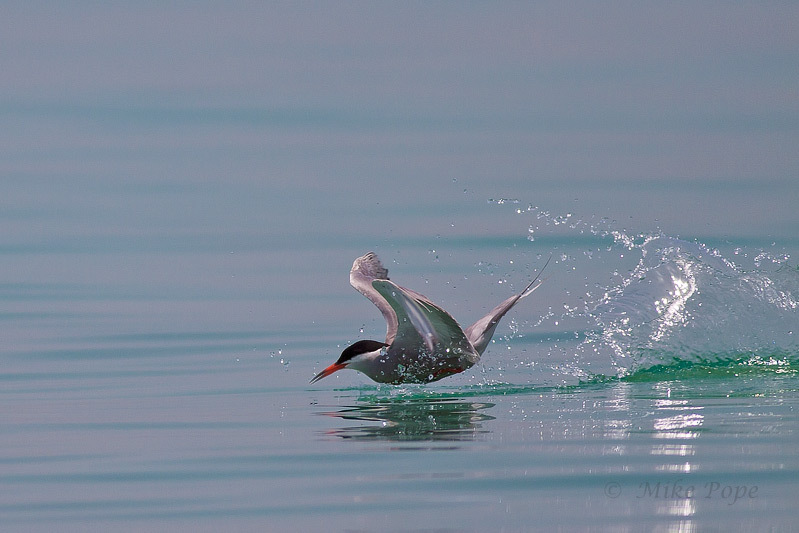 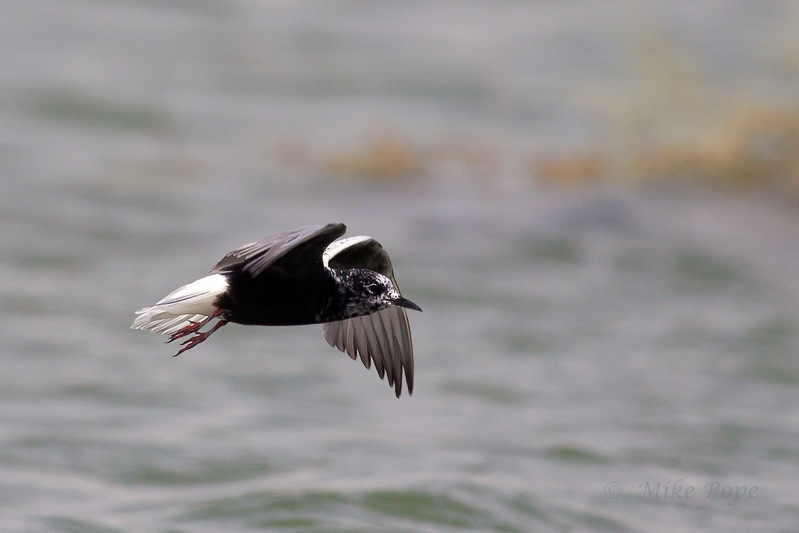 We swam to shore and encountered some White-cheeked Terns with recently fledged chicks already down at the waters edge where the lower temp at the shore line helps these very young birds to better regulate their core temperatures (my theory anyway). But this is also where the most disturbance occurs with so many people on the beach - the adults continuously having to fly off, leaving the young exposed - sometimes for too long. 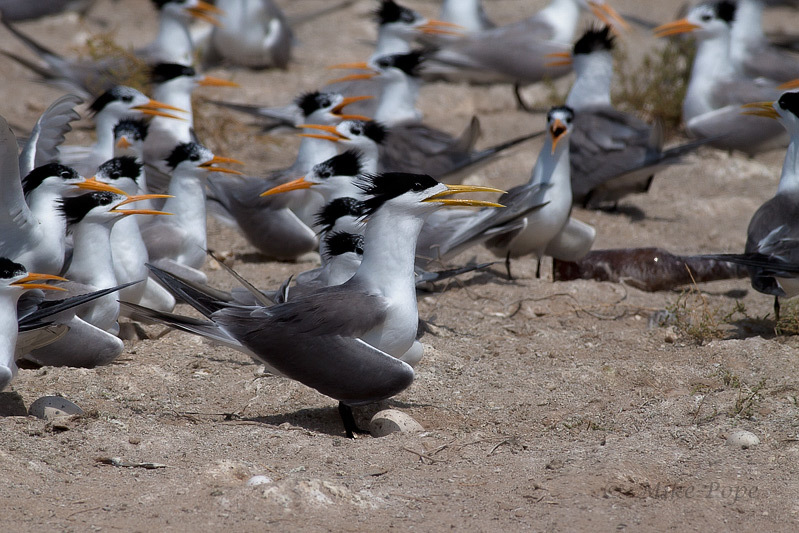 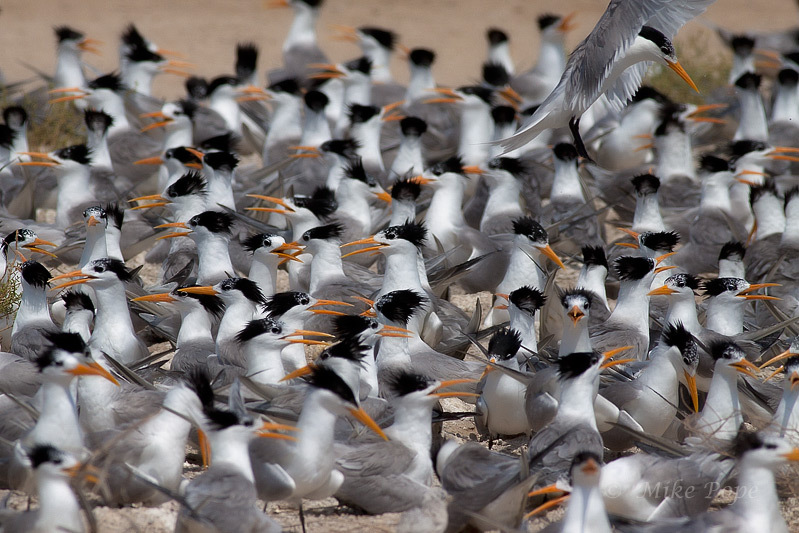 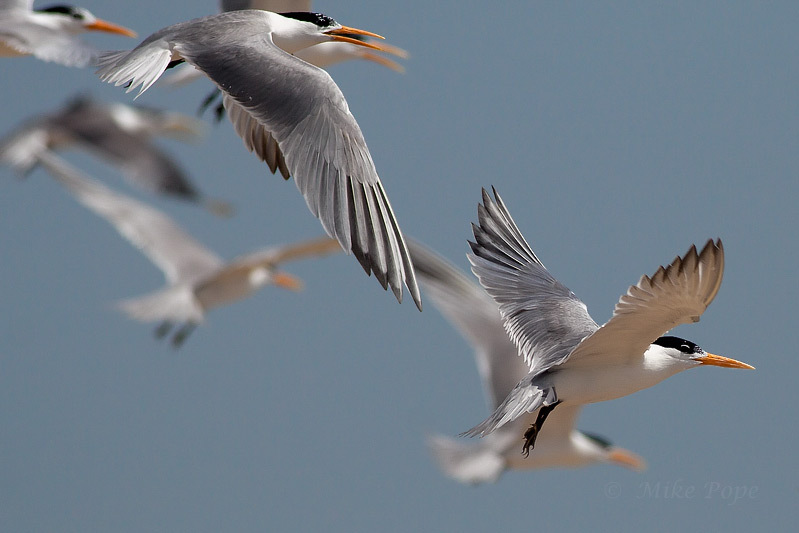 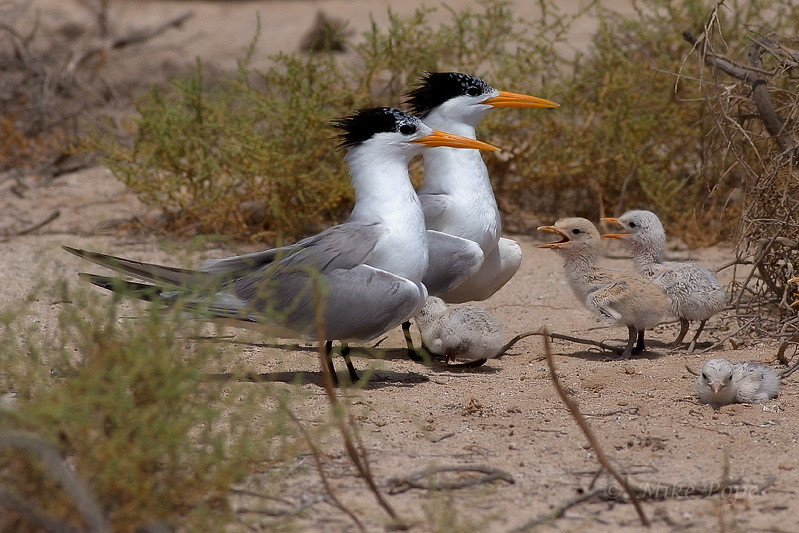 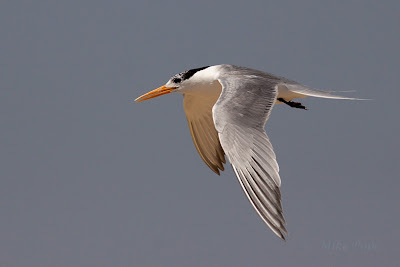 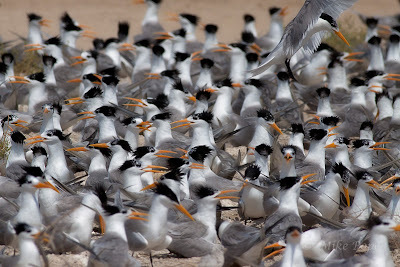 Many White-cheeked Terns were still on their bare nests with both eggs and young away from the sea. 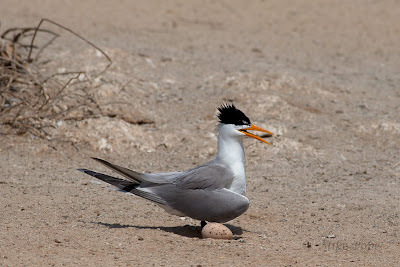 I am amazed everytime I see this spectacle that the adult birds sit on the eggs without any protection whatsoever from the elements and successfully raise their young. 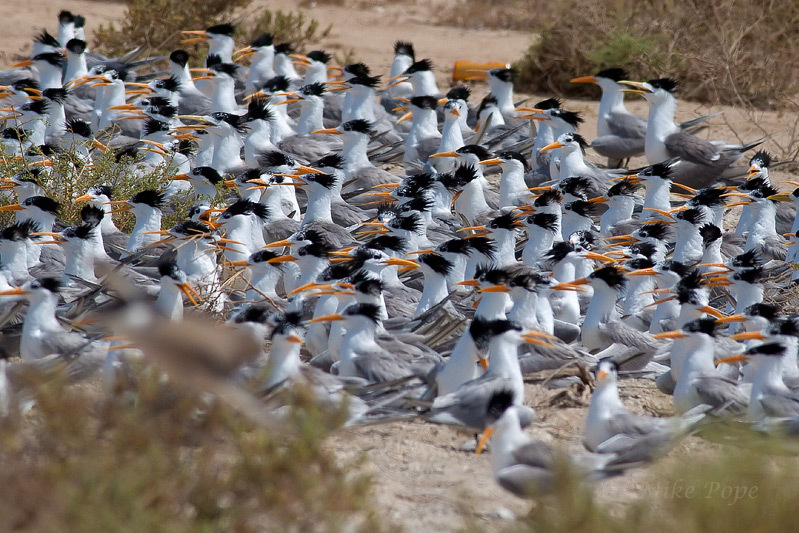 In a different area of the island, the Lesser-crested and Swift Terns have a chaotic (it seems) communal nest site with eggs and young appearing to be haphazardly distributed. 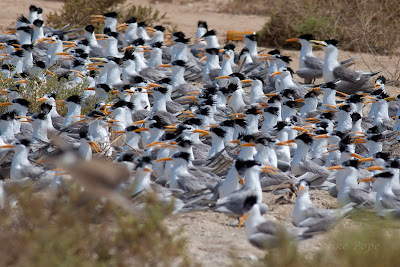 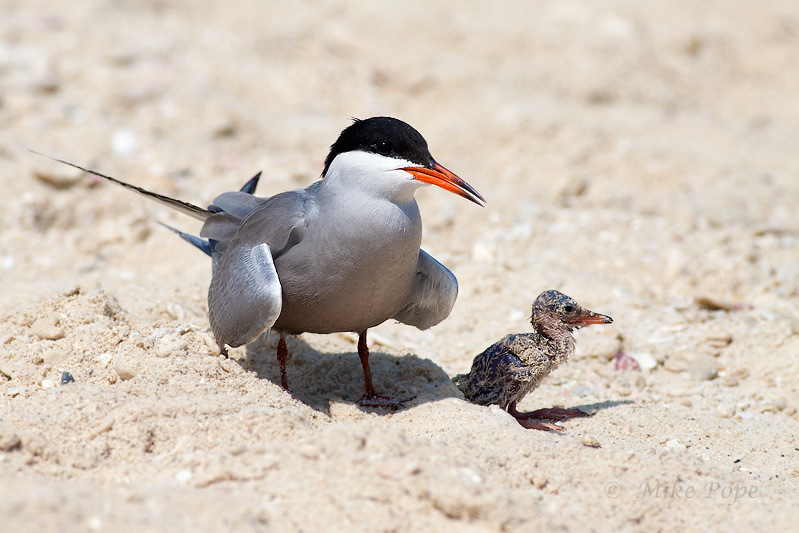 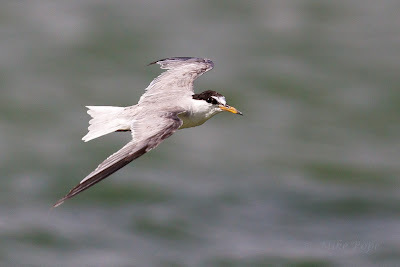 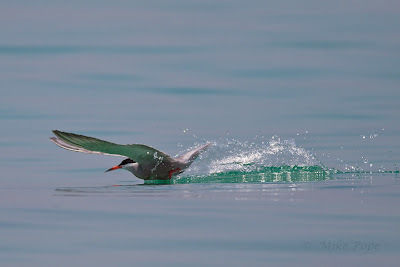 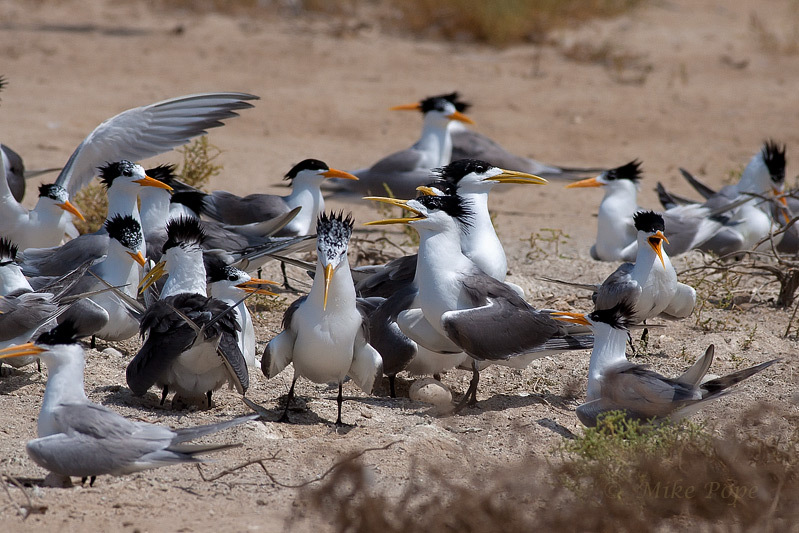 Interesting that the much larger Swift Terns (though much fewer in numbers) choose to nest with the Lesser-crested. Whilst sitting on the beach, we watched with interest how the Bridled and White-cheeked Terns would leave their nests (with eggs and young) and wet their belly feathers in the sea. Again, I assume this is to provide some coolness to assist with better regulating the temperature for eggs and young. 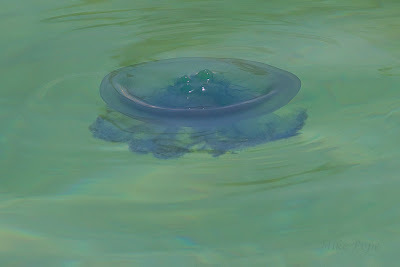 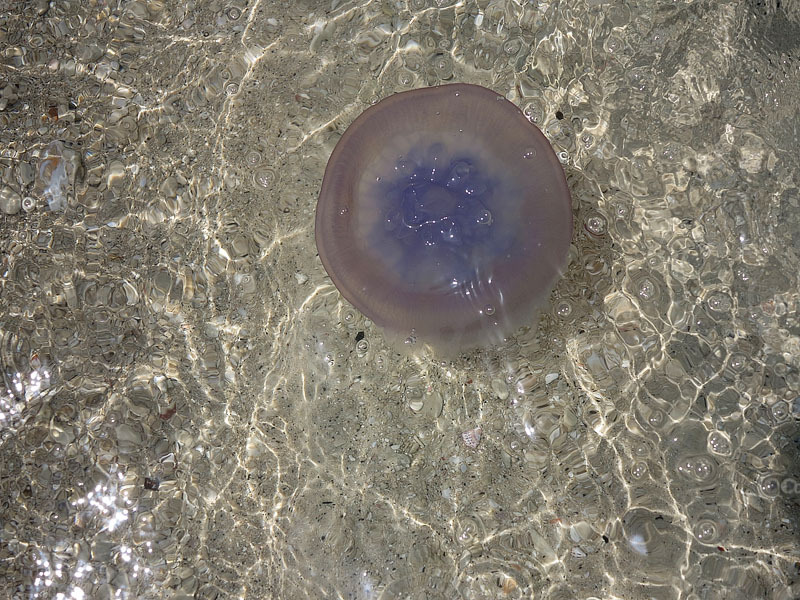 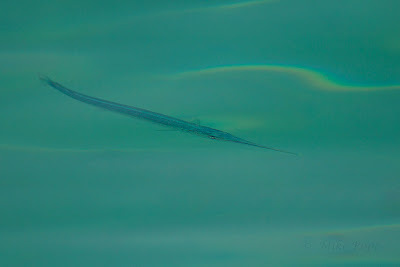 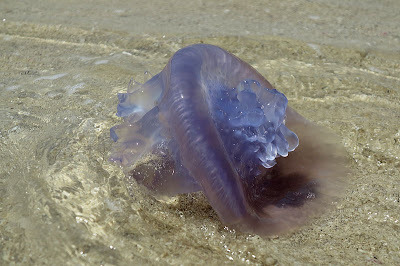 Whilst swimming we had an influx of Jellyfish (not sure which species) and saw a small school of Garfish from the boat. Again, I was reminded how selfish some people are when you see the absolute mess that is left behind after spending a day on what could be a pristine beach on this small island, as well as an absolute disregard for the breeding birds by some individuals. 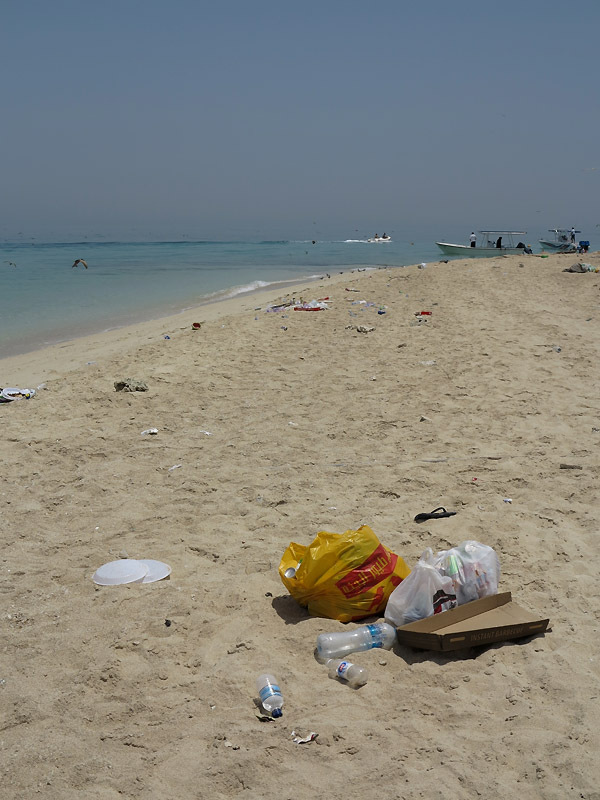 This highlights the need for awareness that this important little island is for breeding birds (and only for 8-weeks of the summer) as well as people and it is up to us to respect our environment and to be responsible to clean up after ourselves. 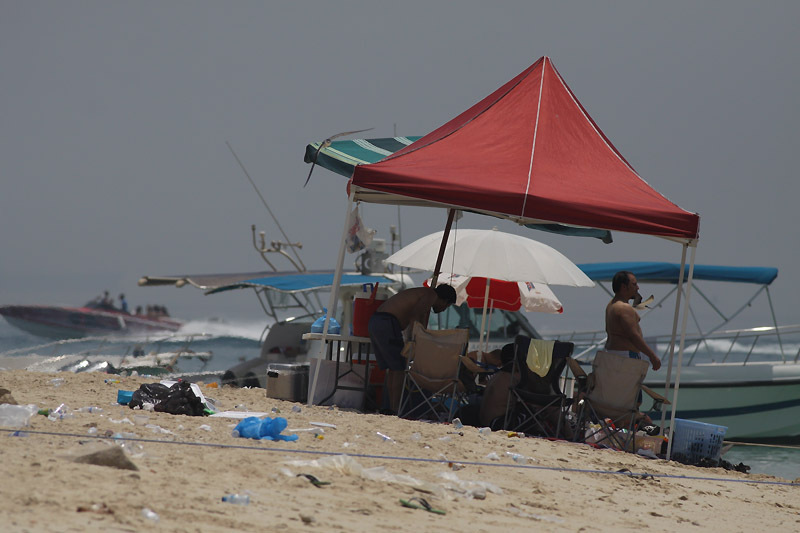 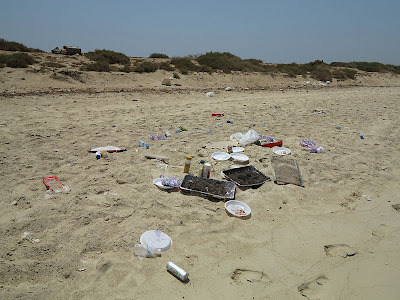 If visitors have packed their picnics and bbq's to take to the island from the mainland, how hard is it to take the same stuff back with you - really? 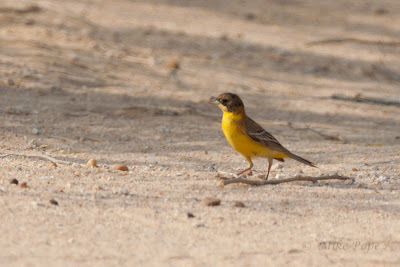 Take only pictures - leave only footprints - dont we all wish for that!